PORTLAND, Ore. -- There are players, and coaches, who seem to grow larger behind a podium. Players who feel the cameras and take control, coaches who know how to get a room of writers laughing. 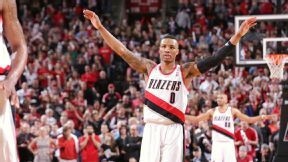 The Portland Trail Blazers have no such players. Even after a 123-120 overtime home win to take a commanding 3-1 series lead over the Houston Rockets, the Blazers are stacked on bench and court with characters who turn down the microphone. Never uncomfortable but never brash, the Blazers after a win are almost indistinguishable from the Blazers after a loss. Heart-stopping between the buzzers and sleep-inducing in front of the cameras; it's a recipe the Blazers have spent the past two years perfecting, and it's not looking like they'll tweak it soon. 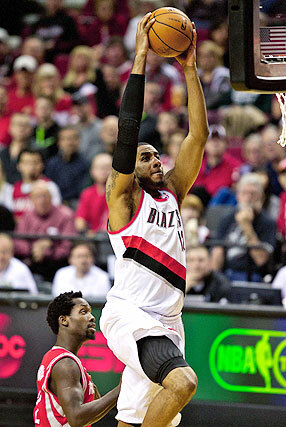 Sam Forencich/NBAE via Getty Images Damian Lillard and the Blazers stay on an even keel despite some wild finishes. Young and upstart teams are often seen as progressing through organizational phases: erratic but promising, steadying but incomplete, and, finally, fully seasoned. The transition between Steps 2 and 3 usually involves importing "veteran savvy" or something similar. Derek Fisher on the Thunder is perhaps the platonic example. The idea is that teams are ready to step into their full potential once they've settled and learned how to brace themselves against the long gales of an NBA season. The Blazers are almost the opposite -- built around an unusually stable foundation, they're taking a step forward in a series as volatile and evenly matched as any. It is true that they're up-and-coming, and it's true that they're relatively young, but the Blazers were stable even in their embryonic phase. Three of the starters have been in place for years, and four played together last season. Even as a 33-win lottery team last season, the Blazers kept angst and frustration at bay. There were token nods to pride, sure, and a determination not to grow content with losing, but the Blazers rarely strained against their limitations. They spent most of this season the same way. Damian Lillard took a larger role in the mature and understated locker room that Wes Matthews and LaMarcus Aldridge had marshaled the year before. In November, as the toast of the league, the Blazers were grounded. Afterward, as they fell out of favor, they stayed grounded. Until they couldn't afford it anymore. Following Sunday night's win -- the third game of the series' four that has gone to overtime -- the Blazers cited the tumultuous last month of the season as a crucible that prepared them for a wild postseason. With Aldridge in and out of the lineups with injuries, the Blazers for a time looked like the team that every serious contender would want to play in the first round. It has become, in retrospect, a time when the team found its mettle. "I think the thing that helped us most this season is going through what we went through right before the playoffs started," said Lillard postgame in his usual, matter-of-fact way. "We couldn't put teams away. We lost close games. You know, we were almost out of the playoffs. We were flirting with being in ninth place. We had a couple team meetings and got the ship going in the right direction, and because we went through that, that made us a closer team, that made us a tougher team, and it prepared us for times like now." • Youngmisuk: Playoff vets, Nets? So it was that the players kept their heads in overtime after relinquishing a five-point lead in the final seconds of regulation. So it was that after a loose-ball scrum -- all but identical to the one that had preceded Troy Daniels' heartbreaker in Game 3 -- Mo Williams threw a head-fake and stepped into a 3 that finally wrested control of the game. So it was that Lillard, Blazers coach Terry Stotts and Aldridge took the podium as sedate as ever, insisting that their focus remains narrow even as the team can taste the franchise's first trip to the second round in more than a decade. For a team building something new, the Blazers take great pains to talk like old hands. Right now, that mentality might be the difference. A speechless, haggard-looking Kevin McHale addressed reporters between pained silences to say that in the postseason, "you've got to be built for the grind." The Rockets coach's meaning was clear: for now, the team that looks most ready to grind is the team holding a 3-1 advantage. There was a time, not so long ago, when it seemed like the Blazers were more complacent than balanced. After a season of porous defense, they didn't seem to be improving. As the long ball deserted them somewhat, they didn't seem to challenge defenses for harder shots. As they stayed the course in tone and play, it was easy to wonder if they had the requisite combustibility. But they broke character for just long enough to find a little extra hardness. It was perhaps said best by Stotts, who was characteristically dry and low-key in his presser: "I think we're at our best when our backs our against the wall, when we have something to prove, whatever phrase you want to use. We have a determination to us. We know what we want to do, and most times we do it." MVP: LaMarcus Aldridge gets the game ball for scoring 29 points, grabbing 10 boards and battling Dwight Howard in the post with some tremendous late-game defense. Aldridge missed two late free throws that kept Houston's hope alive, but at this point, Portland would be lost without him. LVP: In 21 minutes, Jeremy Lin scored four points, missed five of his six field goal attempts and made a critical turnover late in the game that allowed Portland to creep back in. That was ... gritty: Wesley Matthews played fantastic defense all night long, but his lunging steal (fourth of the game) with two seconds left in a one-possession game will be remembered in Portland for years to come. MVP: Amir Johnson finally came through. He excelled in finding pick-and-roll space, finishing with 17 points, but he made his money on defense. Despite picking up five fouls, Johnson shouldered the Raptors' defense and helped hold the Nets to 12 fourth-quarter points. X factor: The 3-point line. The Nets clamped down on the perimeter, holding the Raptors to six treys, but Brooklyn couldn't capitalize on a variety of wide-open looks on their end. They nailed an abysmal 4 of 20. Even a decent showing from beyond the arc could have tipped the scale for the Nets. That was ... a hodgepodge. Neither squad was able to put together a consistent effort, amounting to a game with eight lead changes and countless emotional breakdowns from fans. This didn't really feel as much like a game as it did a confluence of highlights. MVP: Stephen Curry has been held in check for most of the series, but Sunday he went off for 33 points and seven 3-pointers. In the first quarter alone he made five long-range shots, giving the Warriors a comfortable lead early that the Clippers could never overcome. Defining moment: With 3:18 remaining, Curry, who isn't known for his defense, blocked J.J. Redick's 17-foot jumper. The ball ended up back in Redick's hands before going out of bounds, resulting in Warriors' ball. Curry turned to the crowd and yelled in caveman fashion, epitomizing both his epic performance and the Dubs' lockdown defense. That was ... emotional: Before tipoff, the Clippers huddled at midcourt, took off their warm-ups and left them there, and warmed up in inside-out shooting shirts with no Clippers logos or lettering. During the game, they wore black armbands and wristbands as a form of silent protest. MVP: Trevor Ariza simply could not be stopped. His six 3-pointers (four of which came in the first half) tied a Wizards playoff record, while his dunk with just under a minute left in the game was the deciding nail in the Bulls' coffin. X factor: John Wall. While his shot wasn't falling Sunday, Wall played the role of orchestrator to perfection, especially late in the game, when he found Marcin Gortat for a dunk that stifled the Bulls' late-game charge. LVP: Carlos Boozer was a wreck on both ends of the floor. He couldn't stick with Gortat or Trevor Booker on defense, while on offense his shot was nowhere to be found. Worse, he had a 3:30 stretch in which he committed five fouls. Stephen Curry, Warriors: Curry made a career playoff-high seven 3-pointers and scored 33 points, pulled down seven rebounds and dished seven assists, leading the Warriors past the Clippers 118-97. Jeremy Lin, Rockets No case of Linsanity in Rip City. Lin missed 5 of 6 field goal attempts and made a critical turnover late in the game that allowed Portland to slide back into Game 4 and eventually win it. Now Houston is one defeat away from summer vacation. -- Doc Rivers, on what he might have to hear from Donald Sterling to make him want to return to the Clippers next season. Craig Mitchelldyer/USA TODAY Sports LaMarcus Aldridge's 29 points and 10 rebounds helped the Blazers defeat the Rockets 123-120 in overtime to take a commanding 3-1 series lead. Stephen Curry joined Mookie Blaylock as the only players in NBA postseason history with seven rebounds, seven assists and seven 3-point field goals in a game. Blaylock scored 26 points in a playoff win in 1997 for the Atlanta Hawks.